The Aztec people spoke and some still speak Nahuatl. They originated in mythological place called AZTLÁN. In Nahuatl, "Aztec" means "the people from Aztlan". In addition, the word Aztlan means a "heron". Legend says that there were 7 tribes who lived in Chicomoztoc (the place of the seven caves). Each cave represents a different group of the Nahua people. The people eventually left their caves and settled in a place near Aztatlan, or Aztlán. Later, tired of living under a tyrannical group of elite group called the Aztec Chicomoztoca, many left the region on May 24, 1064 AD and migrated to Tenochitlán, in the valley of the present day Mexico City. As the migration began, their priest told them that they should not called themselves Aztecs, but rather should call themselves MEXICA. According to Aztec legends, the Mexica were the last tribe to emigrate. When they arrived at their ancestral homeland, the present-day Valley of Mexico, all available land had been taken, and they were forced to squat on the edge of Lake Texcoco. 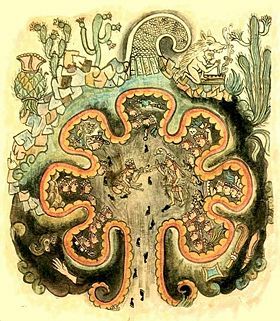 After the Spanish conquest of Mexico, the story of Aztlán gained importance and was reported by Fray Diego Durán in 1581 and others to be a kind of Eden-like paradise, free of disease and death, which existed somewhere in the far north. These stories helped fuel Spanish expeditions to what is now the American state of California. Friar Diego Durán (c. 1537–1588), who chronicled the history of the Aztecs, wrote of Aztec emperor Moctezuma I's attempt to recover the history of the Mexica by congregating warriors and wise men on an expedition to locate Aztlán. According to Durán, the expedition was successful in finding a place that offered characteristics unique to Aztlán. However, his accounts were written shortly after the conquest of Tenochtitlan and before an accurate mapping of the American continent was made, therefore, he was unable to provide a precise location. Durán, himself, considered Aztlán, Colhuacan, and Chicomoztoc to be different names for the same place of origin which he believed to be located to the north of New Spain, near present-day Florida. In 1789, Francisco Javier Clavijero, a Jesuit priest and historian, deduced that Aztlán lay north of the Colorado River. Archaeologist Kelley Hays-Gilpin from Northern Arizona University acknowledges the linguistic connection between Mesoamerican and North American peoples. However, she theorizes that the Aztec's ancestors may have traveled north before returning south. Hayes-Gilpin believes Uto-Aztecan speaking people spread north to an area of the American West that could have included Utah. Out of those cultures, some groups could have migrated south to northern Mexico, and some could have, as she says, moved to the Valley of Mexico where they subjugated tribes in that region. Just a few years ago, a volunteer mission medical team visited the Mexican state of Yucatan, where some people still speak Yucatec, one of the 32 dialecs of the Maya people. Strangely, one of the medical team support group who was from the state of Utah said that he recognized a number of their words spoken in Yucatec. He spoke some of the language of the Ute language. So, for sure, there was somewhat of an early "tie" between the two groups.